Secrets of Magic 3: Happy Halloween is rated 4.8 out of 5 by 22. Rated 5 out of 5 by gimmegames from I found it surprisingly addictive The various modes make this very replayable. The gameplay environment is excellent, both as to sounds and as to graphics which are fun and don't grate on one's ears or eyeballs. After a while I ignored decorating the house, and just played the match-3 boards. Relaxing (- I avoided the timed modes ;-)...). Rated 5 out of 5 by blipi69 from Great Match3 I love it - already played part 1 and 2. It is a great gaem that reminds me a little of the "bonus" game serial. Good graphics - not too hard levels but also not easy. I reccomend this game! Rated 5 out of 5 by fredandethel from Green Sauce games does it again As with several other series of games, by various developers, I found the first is a permanent favourite, the second I didn't like, and the third is another favourite - in spite of a couple of occasional bugs like the tasks in the top right corner showing a couple of blocks left when actually they are all cleared, and the house ornament buying screen sometimes not working. Both these problems sort themselves out at the second attempt. I like to play in limited move mode, even if it's costing me so much in extra moves it looks as though I'll have to replay half the game to buy the last item! 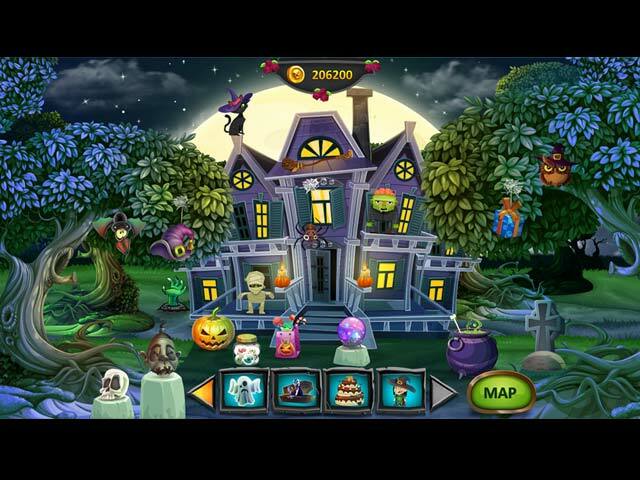 Rated 5 out of 5 by Bumbles2 from Spectacular Halloween game and fun too !!! 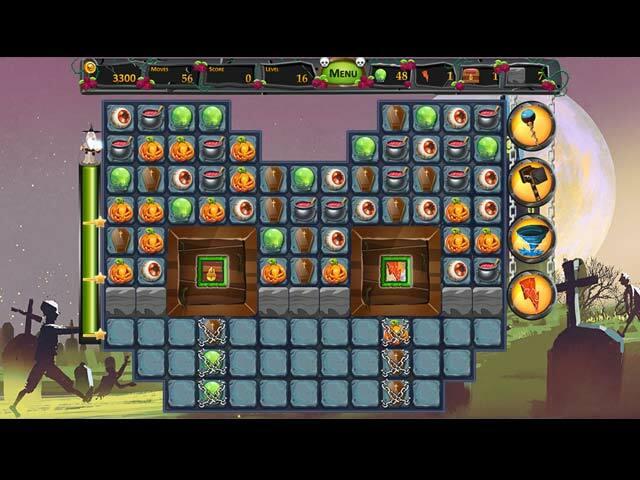 This is a great match 3 game...it's your job to decorate your house and yard with spooky crazy characters. As you play you will get points and stars that allow you to purchase different items for your yard and home. Basically that's it...other than being incredibly fun to play and very addictive too !!! The graphics are crisp and clear and well done...Grats to the artists...the music is definitely suited to this game and also quite pleasant to listen to. There are a couple of challenging areas that are not too difficult to figure out. My Grand'kids figured it out without any problem at all !!! All in all a super game to play. !!! Rated 5 out of 5 by beltie from Sooo Cute This game is sooo cute. I play these games to relax. Love the graphics, the theme, and decorating the house. Nothing macabre or gross. Just good, fun Halloween theme that the kids can play too. Multiple choices for gameplay as others have described. Did get one surprise though. Even if you play Untimed, you still have limited moves to achieve 3 stars. If you exceed this, you can still finish the level, you just lose stars. This surprised me, as I didn't choose Limited Moves Option for gameplay. That's okay, just makes one think a little more about moves. Adding to that, you also have requirements for each level. Meaning you have to get a certain number of either pumpkins, brooms, etc. Found this out after I had solved the level (or so I thought), but didn't have enough "brooms". Had to replay for 3 stars. This adds to the level of challenge and for me, made the game even more fun. I do recommend it. Will look up the previous ones in the series as well. Rated 5 out of 5 by bessiegirl from Fun match 3 I always play on relaxed/casual mode so this review is based on that game play. Although played in relaxed play, you still have a challenge in playing for stars. A long match 3 that is sort of a builder game...you buy little items to decorate the "haunted school". Some dialog which you can skip over. Levels started out easy, as in most games but become much more of a challenge as you work through the levels. There is a map, so you can replay a level as much as you want to "up" your star level. A fun Halloween game. Good match 3's are hard to find anymore. Rated 5 out of 5 by verimeri from loved it This is an absolutely delightful game. The first time I played it through I made it as scary as possible. This time I am making it for little kids. My main suggestion- do not forget your power-ups. There are a few levels I played more than once and could never get more than two stars, which was a bit irritating, but if you remember to use your power-ups the majority of levels can get three stars. Rated 5 out of 5 by deddu from Happy Halloween Great game for this time of year. Don't let the graphics fool you this game becomes harder even in the relaxed, casual mode as it is tough to get three stars as the levels progress. It is great fun to beat the time in relaxed mode. There are four power ups to assist you and earn money to decorate your house. Rated 5 out of 5 by denniann2 from a nice 100 level M3 you are decorating the outside of the magic academy for halloween with the coins you earn by solving levels. you earn power ups as you go and they recharge as you play!!!! i played on the relaxed level but there is one more level. even on the relaxed level you get more stars if you solve it but it doesn't make any difference. you are not penalized if you don't do it fast enough. 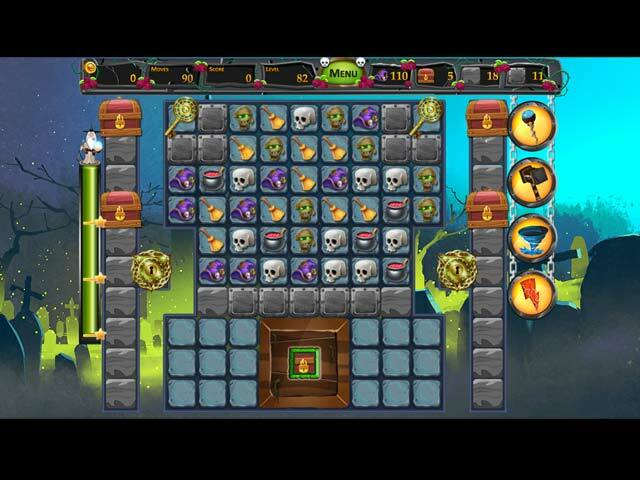 Rated 5 out of 5 by thornyrose69 from This game is FUN! This game is FUN! and you can lose track of time playing. Didn't get boring at all. Love the Halloween theme! Great game for kids and adults.